But there is already a Forgood in South Africa, and has been for many years. The established organisation says it doesn't mind the newcomer campaign all that much – because it can turn the confusion to good. 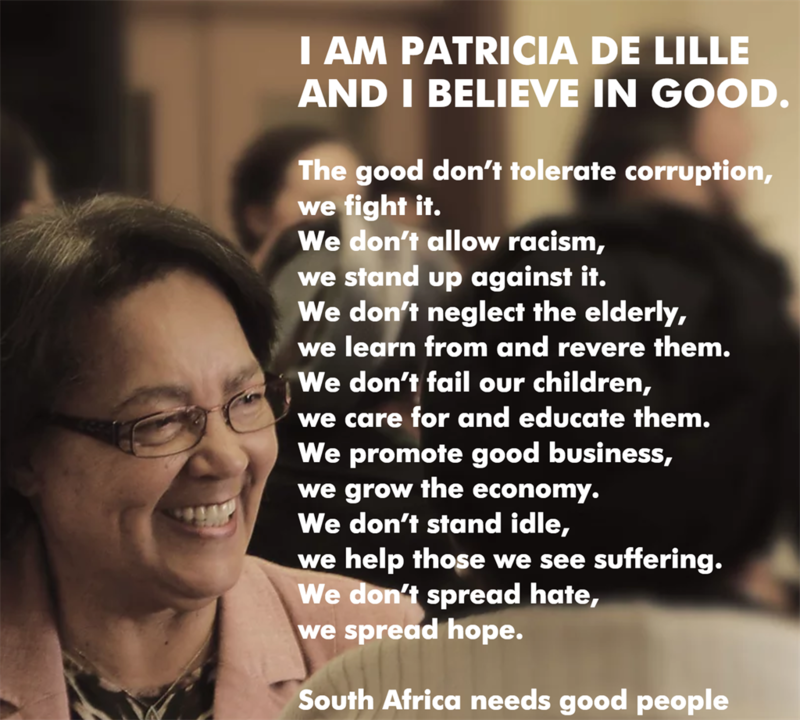 On the weekend former Democratic Alliance leader Patricia de Lille announced her plans for a new political party and launched a campaign around it called ForGood. There's just one problem: South Africa already as a Forgood – and has had for many years. But the platform that goes by that name is not entirely unhappy about De Lille's choice. "We think this shows it is really important to Google competitor names before you launch projects," Andy Hadfield, CEO of Forgood (the social enterprise), tells Business Insider South Africa. Now that De Lille has launched with its name, Forgood (the social enterprise) is "going to have some fun with it" and use the opportunity to drive more people to more good causes, says Hadfield. Forgood – the social enterprise – has been around since 2010, and in 2015 relaunched as a way to connect people to causes, and to date it has recorded more than 22,000 such connections. Right now it is helping Hospice Rustenburg to find donations of sanitary pads and Iris House Children's Hospice to find donations of nappies, helping the P.E.A.C.E Foundation to find volunteers to fundraise for the relocation of elephants, and helping The Sozo Foundation find volunteers to mentor high school pupils. As of Monday the platform features 451 different non-profits looking for help in nearly 2,000 different ways: 1,393 calls for donations of goods, and 512 chances to donate skills or time. ForGood – the political platform – is looking for people to join by giving it their email addresses and phone numbers, and so become one of the good people it says will fight for good people. "Forgood is not the name of the party," De Lille told Business Insider on Monday. "This is a call to action for good South Africans to join a movement for good. We will announce a name in the next two weeks." The donation Forgood platform already saw an unusual surge in traffic over the weekend after De Lille announced her new party, Hadfield says, and expects a lot more such confused traffic as South Africa's 2019 elections near. If the name confusion enables it to build a nation of volunteer, so much the better. Although Forgood (the social enterprise) has been trolling De Lille on Twitter, it has yet to hear from the political leader or its namesake organisation, says Hadfield.